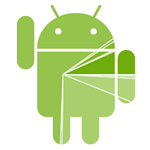 With the end of another month comes a fresh batch of Android platform distribution numbers. 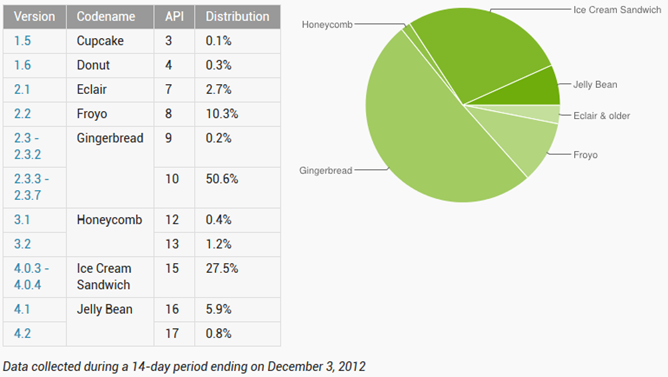 Like clockwork, Google has once again updated their numbers, showing Gingerbread's cold, withered hand still holding almost 51% of the pie (though it's down from 54.2% in October), with Jelly Bean making gains to 6.7%, up 4% from last month. Predictably, Ice Cream Sandwich is still making some gains, rising about 2% to 27.5% from October, Honeycomb is holding tight at 1.6% with a mere 0.2% change for API level 13, and pre-2.3 releases are still dropping off (though Cupcake and Donut are still holding on for dear life). Like always, the arrival of a new pie chart brings an updated historical distribution chart, which shows the growth and decline of each version of Android in a lovely visual that sorts builds old to new, top to bottom. Interestingly, Google has opted to lump some builds together under their overarching code names, for example ditching the 4.0.x designation for simply "Ice Cream Sandwich." To see the full report (including more interesting and useful numbers), just hit the link below.